Dogu, D., Yilgor, N., Mantanis, G., and Tuncer, F. D. (2017). "Structural evaluation of a timber construction element originating from the Great Metéoron Monastery in Greece," BioRes. 12(2), 2433-2451. This study identified the wood species and evaluated the degree of weathering and biological degradation of a historical timber construction element originating from the Great Metéoron monastery in Metéora, Greece. The wood material was provided from the interior side of a balcony that was fully covered with a roof and exposed to outdoor conditions for more than 400 years. The species was identified as Quercus spp. of the white oak group. In the timber element, the physical, morphological, and chemical changes were studied to assess the type and extent of degradation using light microscopy and Fourier transform infrared (FT-IR) spectroscopy. To examine the degree of biological degradation and weathering, the surface layer and inner parts of the specimen were studied separately and compared with a recent wood specimen of the same species. The FT-IR analysis revealed remarkable differences between the surface layer and the inner parts of the historical wooden element. Macroscopic and microscopic investigation indicated that multiple types of degradation caused by weathering, fungi, and insect attacks had occurred in the wood structure. It was finally concluded that the historical timber construction element was in better condition than was expected before the study. Wood has been used as a primary raw material for construction, household utensils, agricultural tools, war equipment, and energy resource throughout the history of mankind. Because wood is an organic material, it is susceptible to degradation by biotic and abiotic factors (Blanchette 2000; Beldean and Timar 2013). Very old wooden remains have a high artistic, historical, and cultural value, for which they have to be preserved and sometimes restored (Macchioni et al. 2013). In that respect, anatomical, physical, and chemical analyses of old wooden remains are essential to collect important technical information. The Metéora (in Greek, meaning “suspended in the air”) is one of the largest and most important complexes of Greek Orthodox monasteries in Greece. The six monasteries of Metéora have remained intact. They were built on natural sandstone rock pillars at the northwestern edge of the plain of Thessaly near the Pineios River and Pindos mountains in central Greece (Anonymous 2016). Several wooden structures, some as old as 600 years, were assembled upon the Metéora monasteries; the oldest one established in the Great Metéoron monastery was founded in the middle of 14th century A.D. (Fig. 1). A large number of structural timber elements, primarily from the oak and chestnut species, along with wooden floors, roofs, and timber-framed walls are still standing in the monastery (Tsakanika 2007). Most timber elements need thorough conservation and restoration due to the very extensive weathering and biological degradation they endure (Paggitoulis 2007). Because of the steep location, the monastery has been restored three times since the 14th century, while several heavily decayed timber elements have been conserved, restored, and/or replaced. The last restoration of wooden elements in the monastery occurred from 2000 to 2001. In Fig. 2, some of the well-weathered timber elements from this monastery are shown (Paggitoulis 2007). During this restoration at the Great Metéoron, scientists from the Department of Wood and Furniture Design and Technology (WFDT), TEI of Thessaly collected wooden pieces originating from old columns (Kakaras and Mantanis 2007). According to the older monks of the monastery, these timber columns dated back to during the restoration and embellishment project in approximately 1552 A.D. The columns originated from the oldest part of the monastery, namely, the old wooden balcony bearing the nets used at that time. In fact, those timber samples were apparently used as construction elements and were sporadically exposed to climatic effects (rain, wind, and snow). A recent study respecting the Metéora wooden structures by Paggitoulis (2007) revealed that many of the wooden columns have suffered all types of surface degradation (fungi attacks, insect wormholes, checks, and deterioration due to weathering). The timber samples collected were kept at WFDT in a dry room, at normal climatic conditions, and never came in contact with water or other damage. This paper aimed to identify the wood and evaluate the degree of weathering and biological degradation of a very old timber construction element that was obtained from the Great Metéoron monastery after the 2000 to 2001 restoration. For this purpose, the most degraded timber element was chosen, cut, and examined using several anatomical, chemical, and physical methods. The importance of this sample is its exposure to natural weathering conditions throughout several centuries. Therefore, this study provides valuable information for the scientists who work in wood anatomy, wood mycology, wood chemistry, and wood restoration. The wood material used for this experiment belonged to a very old timber construction element that was obtained from the monastery after the 2000 to 2001 restoration. It was used at the interior side of a balcony that was fully covered with a roof and exposed to outdoor conditions for more than 400 years. Metéora has a Mediterranean continental climate with hot summers and cold winters. The spring, from March through May, gets steadily warmer. Summer, from the months of June through September, is hot and prone to thunderstorms. At nights, the heat and humidity can be stifling. During autumn, in October and November, the temperatures drop and the heavy rains lighten. The winter, from December until February, is wet and cold, and it often snows. The harsh climatic conditions can also develop with icy winds blowing down from the mountains. Metéora owes its climate to its distance from the sea and its location in the Thessalian Plain, which is surrounded by mountains. Without the moderating effects of the sea, the temperature is able to reach extremes. The mountains also trap humid air, forming frequent precipitation in the area (Anonymous 2016a). The wood species and the condition of the old timber was examined to determine if there was any evidence of insect activity or decay. The macroscopic structure of wood was investigated with the naked eye and a hand lens (10x). Dissection forceps were used to check the hardness of the sample. Microscopic investigation was performed to obtain a detailed evaluation of the wood. For this purpose, heartwood and sapwood samples with dimensions of 10 mm (radial) x 10 mm (tangential) x 20 mm (longitudinal) were obtained. These samples were softened under a vacuum in the presence of alcohol, glycerine, and water at room temperature. Microscopic sections were obtained with a sliding microtome (Leica SM2010 R, Wetzlar, Germany). The sections were stained with safranin and picro-aniline-blue according to the standard techniques (Cartwright 1929; Wilcox 1964). The samples were evaluated on a light microscope with a polarized attachment (analySIS FIVE software, Tokyo, Japan; a DP71 digital camera installed and adapted on an Olympus BX51 light microscope, Tokyo, Japan). The birefringence property in the wood cell walls was also determined under a polarized light. The IR absorption data were obtained by using a Perkin Elmer 100 FT-IR spectrometer combined with an attenuated total reflectance (ATR) unit (Universal ATR Diamond Zn/Se, MA, United States) at a resolution of 4 cm-1 for 32 scans in spectral range 600 cm-1 to 4000 cm-1. The specimens were milled and passed through an 80-mesh sieve, and analyses were then implemented. The spectra were baseline corrected and normalized to the highest peak. The FT-IR spectroscopy was improved by an ATR unit that provided direct interaction of the measuring beam with the sample and reflection of the attenuated radiation to the spectrometer, increasing thus the sensitivity of the FT-IR based analyses. Due to the differences observed in the inner part and surface layer of the old specimen, two different procedures were followed for the examination of the test samples. Because of the discoloration of wood surface, the specimens were taken by cutting the surface layer to observe the weathering effects. Another specimen was taken from the inner part of the historical construction element to assess the effects of the biological parameters. For the study, one recently cut air-dried wood sample, of the same tree species as the construction element, was collected and cut. This wood specimen was used as a control sample in the FT-IR analyses for comparative purposes. The wood sample had distinctive combinations of anatomical features at the macroscopic level; therefore, it was easy to identify it from the cross-section (Fig. 6). In particular, the growth ring boundaries were distinct. It was a ring-porous species, and the latewood vessels were in a radial/diagonal to dendritic patterns. These vessels were numerous and indistinct, which were impossible to view and count individually, and the rays were large (Hoadley 1990; Wheeler and Baas 1998). In accordance with these anatomical features, the wood species was recognised as Quercus spp. (oak wood) of the white oak group. An apparent physical and biological deterioration was observed in the structure of the wooden element at the macroscopic level (Figs. 3 through 6). In general, the surface of the old wood sample had silver gray and darkish gray colors (Figs. 3 through 5). The integrity of the surface was lost, and it looked like a charred structure (Figs. 3 through 5). The sample was in a rather asymmetrical structure, while splits and checks were observed in all of the element surfaces (Figs. 3 through 5). In addition, a checkered appearance was noted at the transversal surface (Fig. 4). Slightly eroded fibers were also observed on the wood surfaces (Figs. 3 and 4). All of the changes that appeared in the wood surfaces could be considered the outcome of weathering. The weathering of wood is the result of the actions of cyclic wetting and drying, exposure to ultraviolet (UV) light, and erosion of the wood surface through the wind load (Feist 1990; Sandberg 1999; Anthony 2007; Lebow and Anthony 2012). At the macroscopic level, the chromatic change of an untreated wood surface was the first and perhaps the clearest sign of the degradation of wood during outdoor exposure. Small seasoning checks and splits also began to develop on the wood surface that allowed for moisture penetration. These turned into longer splits due to cyclic wetting and drying of wood or freeze-thaw action. The weathering process changed the general appearance of wood and gradually eroded the wood fibers (Feist 1990; Sandberg 1999; Anthony 2007; Lebow and Anthony 2012). In this study, cubical cracks and small voids, brown discoloration, fragile structure, and block shrinkage were observed along the two longitudinal corners of the old wood specimen (Figs. 3 through 5). A cottony white growth in the surface of wood was considered a fungal activity (Fig. 5). While the heartwood saved its natural color, the color of sapwood changed to brownish (Fig. 6). Those changes indicated that brown-rot decay might have occurred. The macroscopic signs of wood decomposition could be regarded as the decay in the intermediate stage (Feist 1990; Anthony 2007). In addition to decay, insect boreholes were notably detected in the zone where the brown-rot decay occurred (Fig. 3). Visual inspection of the sample provided further information regarding the past environmental conditions that the wooden material might have experienced. It was clear that the wooden specimen had been exposed to the external atmospheric conditions as it was used as the construction material of a wooden balcony. As a matter of fact, multiple types of degradation interacting with each other were detected in the wood structure. Fig. 5. Macroscopic view of the longitudinal surface of the old sample: Wood surface in silver gray (1) and darkish gray color (2), asymmetrical wood structure (3), splits (4) and checks (5) in the surface, a cottony white growth on the wood surface (6), and cubical cracks in the wood structure (7). Therefore, the weathering effects on the wood took place prior to the fungal and insect activities, based on the results of the macroscopic investigation and the climatic conditions in Metéora, Greece. The biological decomposition became apparent after a certain stage of the weathering process. Microscopic evaluations revealed that sapwood/heartwood and earlywood/ latewood samples were not different in terms of fungal degradation degree and decay pattern (Figs. 7 and 8). In fact, observations such as: a) the distortion in the shape of the wood cells, b) porous and swollen appearance particularly in the cell walls of fibers, c) much more degraded S2 layer of fiber cell walls, d) dark colored residual materials in the lumen side of some cells, e) numerous clefts in the secondary walls of fiber cells, and, f) loss of birefringence were evaluated as clear indicators of brown-rot decay (Figs. 7 through 9). This is in agreement with previous reports (Wilcox 1968; Blanchette 2000; Blanchette 2003). In contrast, splits in the cell walls of the fibers as well as separations between the fiber cells and the fiber-ray parenchyma cells were observed in fewer quantities (Fig. 10). This type of degradation is common for white-rot decay (Wilcox 1968; Highley and Murmanis 1987; Schwarze 1995; Anagnost 1998; Luna et al. 2004). There were different degradation patterns for brown-rot decay, such as cavity formation in the cell walls, extensive degradation of cell walls including the lignin-rich middle lamella, and degradation of the cell corners and middle lamella (Highley et al. 1985; Eriksson et al. 1990; Kim et al. 2000; Lee et al. 2004; Cho et al. 2008). These degradation patterns were reported as normal for white-rot decay. Although the wood sample had been used as a construction element for several centuries, the macroscopic and microscopic examination revealed that it was in better condition than originally expected. The use of a very durable wood species, such as oak, in combination with the environmental parameters (especially unknown moisture and temperature history) played a role in the good condition of the wooden element. The white oak group species are characterized by highly durable heartwood due to the large content of tannins that act as fungicides and insecticides (Gambetta and Orlandi 1982). However, when wood decay began, what had happened through the time period is an important question with answers still unknown. Although the climatic conditions were rather favorable for insect and/or fungal activity in Metèora, the biological degradation of the timber element was prevented because the wood material was in the interior side of a balcony that was fully covered by a roof. The FTIR spectra of the control oak sample and the old wood sample are shown in Fig. 12. The old sample came from the inner part of the element that was exposed to several biological attacks. The explanations of the control wood peaks are presented in Table 1. The peaks were defined with reference to previous literature (Harrington et al. 1964; Faix 1991; Pandey and Pitman 2003; Schwanninger et al. 2004; Naumann et al. 2005). Some differences were observed in the bands of the spectra in this work as compared with the literature. To evaluate the degradation and weathering behaviour of historical oak wood, the surface layer of the sample was separated, and then examined. The spectrums taken from the old sample (inner part and surface layer), and the control sample can be comparatively seen in Fig. 13. A strong hydrogen bond (O-H) stretching absorption was seen at 3332 cm-1 (1) and a next C-H stretching absorption was observed at 2919 cm-1 (2). As shown in Fig. 12, there were no considerable differences between the spectra for the control and old wood (inner part) samples in the fingerprint region. The most important difference was observed in the band at 1648 cm-1. While it was seen in the control sample, it disappeared in the old wood sample. The absorption band at 1648 cm-1 may have been suppressed by a strong absorption at 1592 cm-1, which was the next spectrum and indicated an important amount of lignin presence in the old oak sample. Because the specimens came from a hardwood, the lignin type was of the guaiacyl-syringyl type; thus, it gave noticeable peak absorbance at 1590 cm-1 besides 1502 cm-1, as can be seen in Fig. 12. The syringyl-type of lignin, which is characteristic for hardwoods, absorbs only at 1230 cm-1 (Sarkanen et al. 1967), while both the control and old wood specimens had a remarkable absorbance at 1228 cm-1, a result that was slightly different from the literature (Fig. 12). Furthermore, it was detected that the band at 1590 cm-1 in the control sample shifted to 1592 cm-1 in the old sample (Fig. 12). But the intensity at 1502 cm-1 that represented the aromatic skeletal vibration in lignin was kept in the same level, as can be seen in Fig. 12. Remarkable decreases were observed in the intensities at 1729 cm-1 (3), 1365 cm-1 (9), 1152 cm-1 (12), and 895 cm-1 (15). All of these peaks were derived from the polysaccharides in the wood. Besides, the band at 1730 cm-1 shifted to 1722 cm-1, and the band at 1367 cm-1 shifted to 1362 cm-1 in the old wood when compared to the control (Fig. 12). Even though there was no considerable visible difference between the two wood samples as shown in Table 1 and Fig. 12. However, there were some important differences between the maximum peak heights of the spectrums between the control and old sample. Table 2 lists the ratios, which obtained the lignin peak height at 1502 cm-1, that were ratioed against the carbohydrates reference peaks’ intensities. While 1730 cm-1, 1367 cm-1, 1155 cm-1, and 895 cm-1 were the reference peaks for carbohydrates in the control wood, 1722 cm-1, 1362 cm-1, 1155 cm-1, and 895 cm-1 were the reference peaks for carbohydrates in the old wood. Because the bands at 1730 cm-1 and 1367 cm-1 in the control wood were shifted to the band at 1722 cm-1 and 1362 cm-1 in the old wood, respectively the control and old wood band intensities were taken separately for those bands. Note: Some of the bands of spectra in this work slightly differ from the literature values. Numbers in the parentheses show the band numbers as seen in Figs.12 and 13. (C), control oak wood; (O) old oak wood. The peak at 1502 cm-1 was taken as a reference peak for lignin, and the peaks at 1730(1722) cm-1, 1367(1362) cm-1, 1155 cm-1, and 895 cm-1 were taken as references for the polysaccharides (Pandey and Pitman 2003). The ratio of the peak of wave numbers 1502/1730 cm-1 (1722 cm-1) has been presented in Table 2; they were 0.8020 and 0.9587 for the control and old wood samples, respectively. The peak at these wave numbers were assigned for the C=O stretching in xylans; it was seen that the most noticeable degradation (19.54%) occurred at the band 1730 cm-1, as noted in Table 2. The ratio of the peak of wave numbers 1502/1367 cm-1 (1362 cm-1) was found to be 0.6273 and 0.6666 for the control sample and old wood sample, respectively. The degradation rate was calculated as 6.26% based on the control sample. Also, the ratio of the peaks’ height at wave numbers 1502/1155 cm-1 was found to be 0.4641 and 0.4960 for the control and old wood samples, respectively. Both peaks were assigned for the C=C stretching in lignin and the C-O-C stretching in cellulose and hemicelluloses, respectively. This clearly demonstrated that the cellulose and hemicelluloses had degraded 6.87% more in the old wood sample compared to the control, in the light of this peak absorbance. The ratio of peak wave numbers 1502/895 cm-1 is also shown in Table 2. The peak at wave number 895 cm-1 was assigned for the C-H deformation in cellulose, and the ratio was estimated to be 0.4306 and 0.4794 for the control and old wood sample, respectively. This verifies that, in the old wood specimen, cellulose deformation was 11.33% higher than that of the control sample. 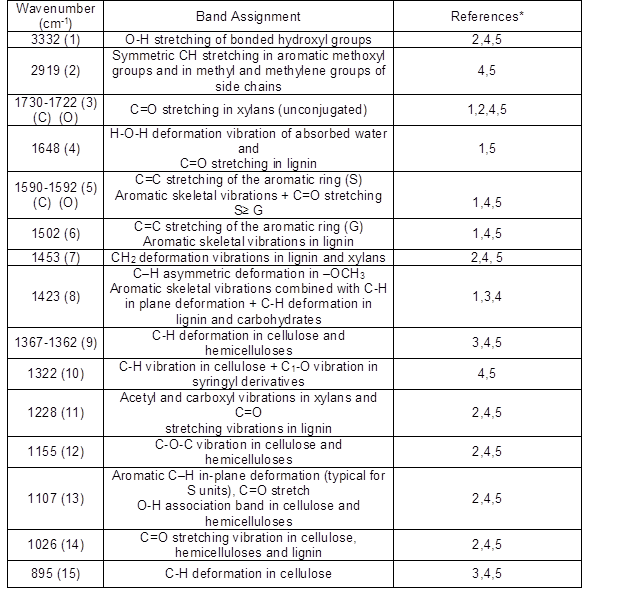 Therefore, it was apparent that the carbohydrates especially polyoses, in the old sample, were subjected to degradation through the years, while the lignin was found to be more stable (Table 1 and Fig. 12). This type of degradation probably occurred via brown rot fungi. Notably, the IR findings were consistent with the anatomical observations. Moreover, the decay progress seemed to be very slow; otherwise, the cellulose in the old wood sample would have been depolymerised in a more rapid rate (Kim et al. 2000). Weathering is a process that is initiated by sunlight along with humidity, air temperature, and easily encountered in outdoor conditions. Even though the wood polymers are susceptible to ultraviolet radiation, lignin is a better absorber of UV light because it has chromophoric functional groups like phenolics, hydroxyl, and carbonyl groups and double bonds (Fengel and Wegener 1984). The exposure of wood to UV light causes some important changes on surfaces, such as discoloration, roughening, peeling, grayish, or a dark color. Thus, the degradation of a wood surface initiated by UV light, could easily be a pathway for the biological agents. The effect of the UV degradation is limited to 75 µm, in the depth of wood surface (Kalnins 1966; Feist 1990). As shown in Figs. 3, 4, and 5, the old oak specimen that was examined, had been exposed to UV radiation over a long period of time, along with rain, snow, and air pollutants; thus, discoloration clearly occurred, and the color turned to silver gray and darkish gray. In this study, from the surface of the old oak sample, a very thin layer was cut and examined by FTIR-ATR. The IR spectra of the control sample and the old wood sample (both from the inner part and surface layer) are depicted in Fig. 13. As expected, the degradation in the surface layer of the old oak specimen was realized in a much higher degree when compared with the inner part of the sample. The peaks at 1590 cm-1, 1502 cm-1, 1453 cm-1, and 1228 cm1, which refer to lignin, disappeared due to the detrimental effects of outdoor parameters, mainly UV light. Additionally, the most apparent change was observed in the band at 1730 cm-1, which indicated C=O stretching in the xylans. While the band at 1730 cm-1 completely vanished, the intensities of the bands at 1423 cm-1 and 1322 cm-1 were largely decreased. In contrast, the bands that refer to cellulose (peaks at 1155 cm-1, 1107 cm-1, 1026 cm-1, and 895 cm-1) were observed and kept their existence at the same wavelength. According to the IR results, the decomposition and modifications in the bands related to the polysaccharides were very clear when compared with the characteristic lignin bands, for the inner part of the old wood sample. Because the old oak material was used as a construction element for some centuries, the weathering effects were more severe. A wooden construction element from the over 400-year-old Great Metéoron monastery (Metéora, Greece) was identified as Quercus of the white oak group. Macroscopic investigation revealed that multiple degradative effects, such as weathering, fungi, and insect attacks, occurred in the wooden structure. These findings were also supported by microscopic examination and IR analyses. Despite all of the degradative effects from the biotic and abiotic factors, the macroscopic, microscopic, and IR findings exhibited that the historical construction wooden element was actually in much better condition than originally expected. IR analyses showed that there were remarkable differences between the surface and the inner part of the historical wood element as a consequence of the different degrees of degradation. This study received no funding. Author GM highly acknowledges the assistance and valuable feedback of Dr. Ioannis Kakaras, Emeritus Professor at TEI of Thessaly, Greece. Anonymous (2016). “The Metéora,” (https://en.wikipedia.org/wiki/Meteora), Accessed 21 May 2016. Anonymous (2016a). “Weather overview for Metéora area,” (http://www.holiday- weather.com/meteora/), Accessed 21 May 2016. Anthony, R. W. (2007). Basics of Wood Inspection: Considerations for Historic Preservation, APT Bulletin 38(2-3), 1-6. Blanchette, R. A. (2003). “Deterioration in historic and archaeological woods from terrestrial sites,” in: Art, Biology, and Conservation: Biodeterioration of Works of Art, R. J. Koestler, V. R. Koestler, A. E. Charola, and F. E. Nieto-Fernandez (eds. ), The Metropolitan Museum of Art, New York, USA, pp. 328-347. Beldean, E., and Timar, M. C. (2013). “Microscopic investigation of degraded wood from cultural heritage,” Pro Ligno 9(4), 228-235. Cartwright, K. S. G. (1929). “A satisfactory method staining fungal mycelium in wood,” Annals of Botany 43(2), 412-413. Feist, W. C. (1990). “Outdoor wood weathering and protection,” in: Archaeological Wood, Properties, Chemistry, and Preservation, R. Rowell (ed. ), American Chemical Society, Washington DC, USA, pp. 263-298. Fengel, D., and Wegener, G. (1984). Wood: Chemistry, Ultrastructure, Reactions, Walter de Gruyter & Co., Berlin, New York, USA. Hoadley, R. B. (1990). Identifying Wood- Accurate Results with Simple Tools, Taunton Press, Newtown, CT, USA. Kakaras, I., and Mantanis, G. (2007). “Repair and conservation of old wooden constructions and furniture at the TEI Larissa, Greece: Education and activities,” in: Workshop COST Action IE0601 “Wood Science for Conservation of Cultural Heritage,” Tervuren, Belgium, pp.65-70. Kalnins, M. A. (1966). Surface Characteristics of Wood as they Affect the Durability of Finishes, Part II. Photochemical Degradation of Wood (FPL-57), U.S. Department of Agriculture, Forest Products Laboratory, Madison, WI. Kim, Y. S., Wi, S. G., and Lee, K. H. (2000). “Micromorphology of oak wood degraded by brown-rot fungus Coniophora puteana.” in: Proceedings of the International Research Group Wood Preservation, Kona, Hawaii, IRG/WP 00-10356. Paggitoulis, N. (2007). Timber Structures in the Metéora Monasteries, Bachelor’s Thesis, Technological Educational Institute of Thessaly, Karditsa, Greece (in Greek). Sarkanen, K. V., Chang, H., and Ericsson, B. (1967). “Species variation in lignins. I. Infrared spectra of guaiacyl and syringyl models,” Tappi Journal 50, 572-575. Schwarze, F. W. M. R. (1995). Entwicklung und Biomechanische Auswirkungen von Holzzersetzenden Pilzen in lebenden Bäumen und in vitro. [Development and Biomechanical Effects of Wood Degrading Fungi in Living Trees and in vitro], Ph.D. Dissertation, University of Freiburg, Freiburg, Germany, (in German). Tsakanika, E. (2007). “Byzantine and post-Byzantine historical timber roofs in Greece: Typical failures, misunderstanding of their structural behaviour, restoration proposals,” in: Proceedings of 16th International Conference and Symposium: From Material to Structure, ICOMOS: International Wood Committee, Florence, Italy, pp. 230-243. Wilcox, W. W. (1964). Preparation of Decayed Wood for Microscopical Examination (FPL-056), U.S. Department of Agriculture, Forest Products Laboratory, Madison, WI. Wilcox, W. W. (1968). Changes in Wood Microstructures through Progressive Stages of Decay (FPL-70), U.S. Department of Agriculture Forest Products Laboratory, Madison, WI. Article submitted: November 12, 2016; Peer review completed: January 27, 2017; Revised version received and accepted; February 2, 2017; Published: February 10, 2017.